Dimensions: total height 78cm, seat height 46cm, width 61cm, depth 57cm, weight 4,2kg. Material: legs in natural oak or wenge beech. Technopolymer shell linen, dove grey and anthracite color. 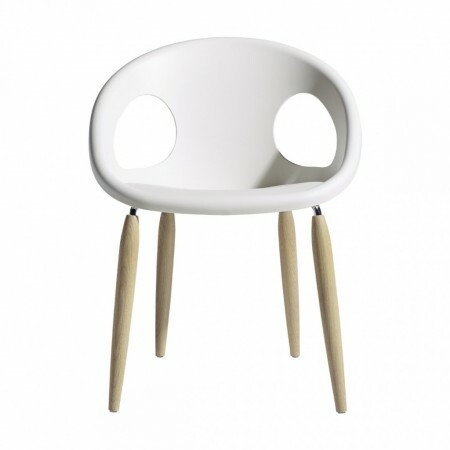 Natural Drop, is a small armchair for indoor use. Thanks to its innate elegance it fits perfectly to any interior design project. ideal both in the domestic sphere than in public venues. Built with technopolymer shell and steel legs coated in solid wood. Available in different combinations, all elegant and refined. Be noted that on request, this armchair may be supplemented with the mobile fabric cushion (item1506). Click here for find out more.